I really love the page that I'm sharing with you all today! It gives you a place to record anything and everything you might need your sitter to know while you are out. 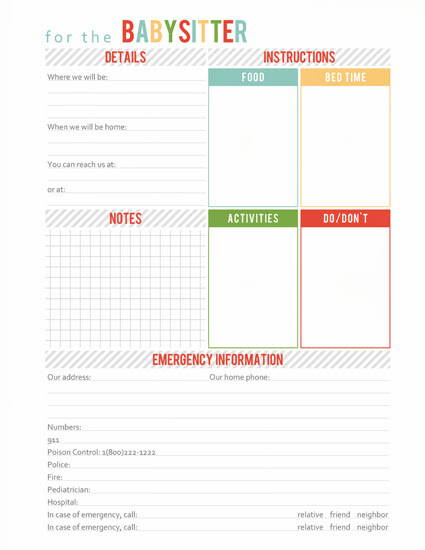 You can print multiple copies of this information sheet and fill it out each time you leave your children with a babysitter, or you can fill out the parts that don't change, slide it into a page protector, and use a dry or wet erase marker to fill the rest out each time you have a sitter. The colors and style coordinate with my Plan Your Life printable planners, so it makes a great addition to these sets. It's also just great to add to any home management binder in general. Give your husband a call, and see if you can't come up with a reason to use this printable very soon!